Nurture Your Health: Happy 2013!! With the start of a new year, it is also the start of another cleanse for me! I am especially looking forward to eating healthy and easy on the body food over the next month. 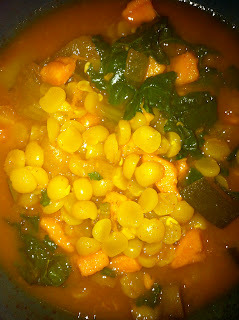 Tonight for supper, I had a variation on the yellow split pea soup from the Jan 2, 2011 post (minus the lemon and thyme and plus 1 yam, cubed, 1/2 cup of cilantro, chopped, 1/2 tsp cumin, and 1/2 tsp coriander) - it was yummy and a good way to start off the new year. Rather than re-posting the recipe, I thought I would share the name of a great cleanse friendly cookbook that I picked up in 2012. It is called let them eat vegan and it is by Dreena Burton. All of the recipes are egg, dairy, and refined sugar free and many of the recipes are gluten (or just wheat) and soy free and are clearly marked as such. If you are looking for additional ideas for meals or snacks to make on a cleanse, this is book is a great resource to draw from! Final Day of the Cleanse!! My favourite volunteer position ever!! Special guests at a simple supper!